Under eyes area, is probably the most sensitive portion of skin on our entire body. Fatigue, ageing, sleepless nights, crying, all have great and instant impact on the area, which needs constant moisture and good beauty sleeps to show fresh, relaxed and glowy. 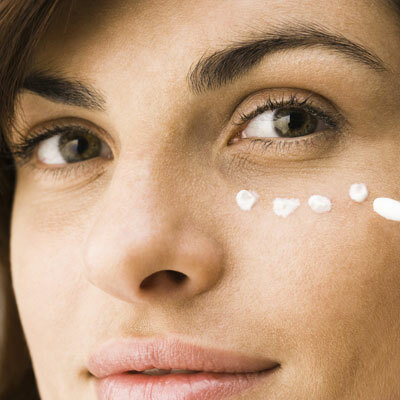 Picking the right eye cream and applying it correctly, not only can save us from doctor’s scalpel but also delays the visible results of ageing and help us either minimize or get rid of dark circles and puffiness. 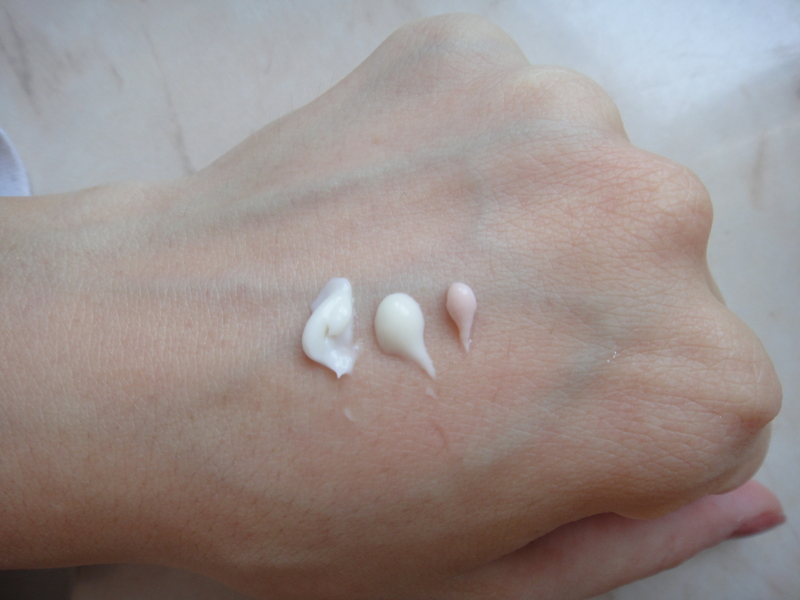 Throughout the years, I have tried numerous eye creams, pharmaceutical or not, high-end and low-end, expensive and cheap, from Vichy to Estee Lauder, and from YSL to Chanel, I have tested a lot! In this post however, I will present you those that really worked on me (as I am in my mid 20’s I care about prevention and moisture) and from times to times I go back to them. First of all, Korres moisturizing eye cream-anti dark circles, from the Materia Herba collection is a product I have renewed 3 times in my beauty stash, fact that proves how much I enjoyed the cream! The tube lasts for about 6-8 months depending on the number of daily applications. I was usually applying the cream in the morning. The cream instantly brightened the under eye area and gave me a feeling of moist. I recommend to let it absorbed fully for 10 minutes, before you apply your eye make up. Also, I loved the fact that the cream did not became flakey when dried (as some of other eye creams did) but gave a rather velvety feeling. Unfortunately I cannot commend on how it works with dark circles as I do not suffer from this issue (yeyy! ), but I can verify that overtime it brightened the eye area. According to the site, the product is made of 97.07% natural origin ingredients and 11.68% ingredients from organic farming. The cream costs 27 Euro and you can find it here. Then, I like to use light eye creams with anti-ageing properties just for prevention. 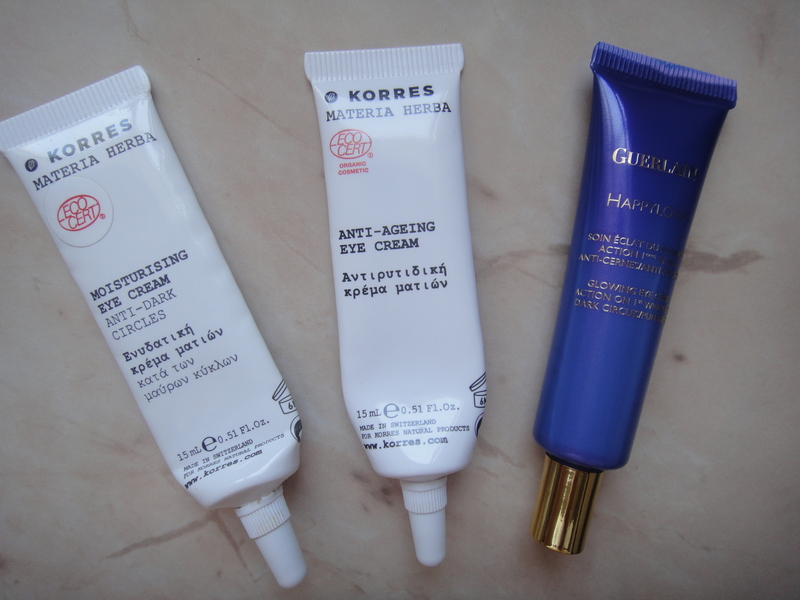 My favourite is definitely the Korres’s anti-ageing cream again from the Materia Herba range. The cream finished just yesterday as I had it for 7 months and I was applying it every night. It fills the fine lines and almost erases them. After 7 months I have definitely noticed a big improvement not only in the look but the moisture level of the area as well. As with the previous cream, this as well is made of 98.94% ingredients from natural origin and 13.34% ingredients from organic farming. Materia Herba is the organic range of the brand. 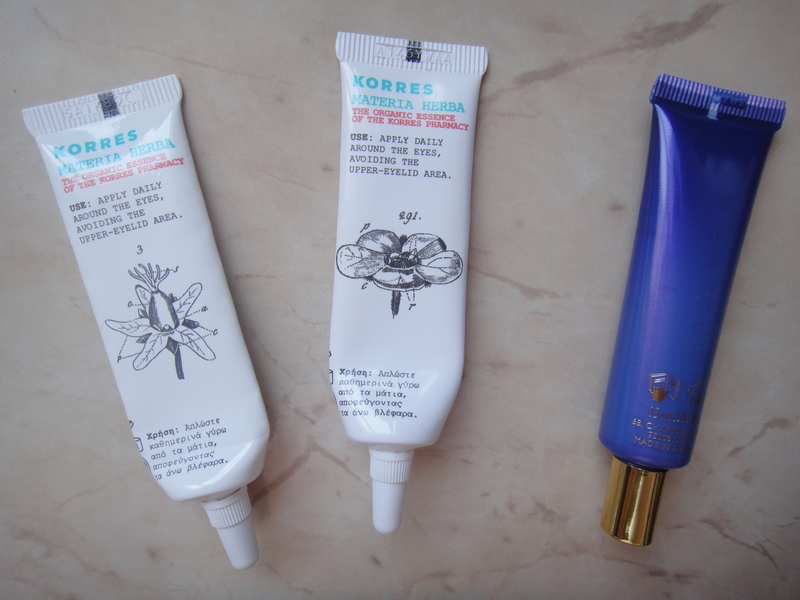 The cream costs 39 Euro and you can have a look at Korres’s site at the Materia Herba section. Last but not least, Happylogy glowing eye care from Guerlain is a cream I firstly used 4 years back and last month I got back to it. I consider it a favourite. It has anti aging properties, it is lightweight and moisturizing but not moisturizing enough, which along with the price are the only downsides. I recommend using it in the morning, under your make up as it is ideal to keep the area fresh and lightly moisturized. I purchased it from Dubai Duty Free for about 170 dhs. In Europe and Britain you can find it for 42 Euro, 38 GBP regular prices. You can have a look at the cream through this link. The way you apply your eye cream, is truly important as with the right pressure and technique you can stimulate the blood circulation and make a big difference on the result. The best way to apply, is by taking a q-tip or a small spatula (which sometimes comes in the eye cream packaging) and picking up a small quantity of product. On clean skin apply 3-5 small dots with the help of the q-tip or spatula. Then, gently smooth the eye cream while padding with your ring finger (it is weaker than the index or the middle finger, hence will not damage the skin). After the cream is smoothed, massage upwards towards the temples. You should be careful not to apply cream on the eyelids, except its is mentioned by the producer that is safe to do so. 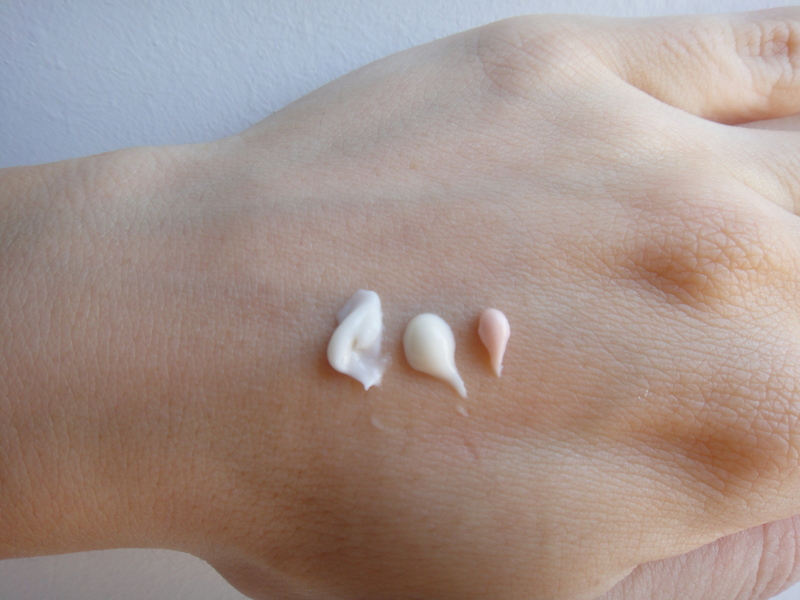 Which is your favorite eye cream? This entry was tagged eye cream, guerlain, korres. Bookmark the permalink.